Do you ever get into an autumn/winter outfit rut? Every year as soon as the weather gets really cold and frosty, I get into a routine of wearing snug sweaters over cotton tees and my favourite jeans. In some strange way my mind tells me that this is the only way I can feel warm, so I just keep on wearing sweaters with jeans till spring :) Am I the only one? Having said that, this year I'm on a mission to change this weird habit and make more effort, while still feeling super comfy. So from today, every week I will post a little understated and wearable outfit and list all the pieces you'd need to recreate it. You probably have most of them (or similar ones) in your closet already. Hopefully those uniforms will inspire us not to fall into our usual winter rut and enjoy the chilliness even more. Deal? 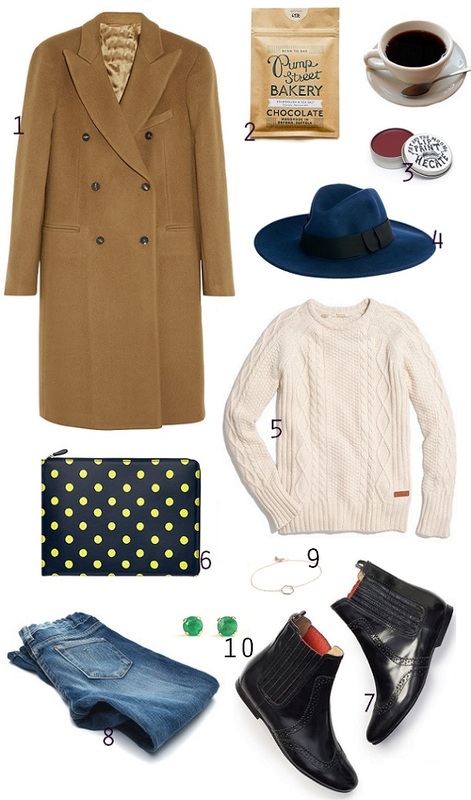 First stop, camel coat - fisherman sweater duo made sassy with a navy fedora and a clutch. 1. Wool camel coat by Zara, 2. Pump Street Bakery chocolate, 3. Fat & The Moon Hecate (wine colour) lip paint, 4. Classic Fedora hat in navy blue, 5. L.L.Bean signature Fisherman sweater, 6. Cath Kidston wallet, 7. Boden boots, 8. Skinny jeans by Gap, 9. Edor's hexagon bracelet, 10. Emerald studs by Andrea Bonelli. P.S: Sundays are for lovers and Christmas dinner at the in-laws. P.P.S: Don't miss our sassy necklace GIVEAWAY! You read my mind. I was just thinking about how I only wear two tops and an old pullover over winter. We are getting ready for summer over here, so I can't even look at those coats and sweaters... It's sooo hot, you can't imagine! 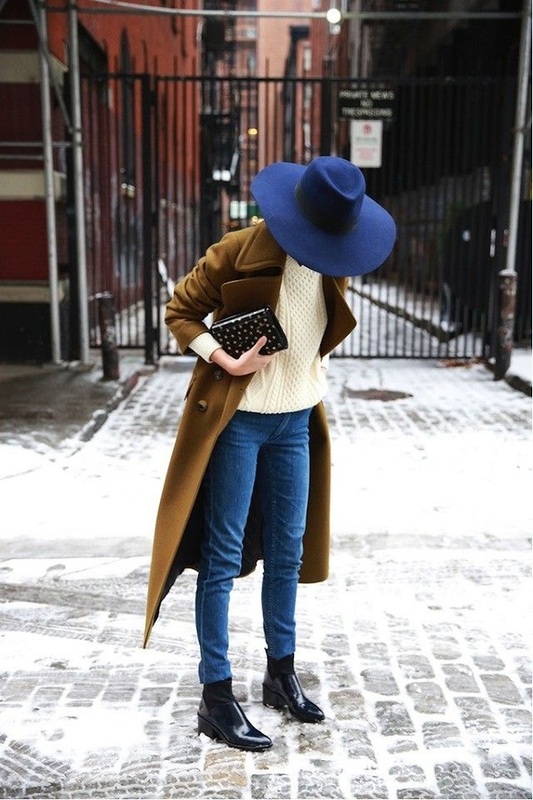 Those boots are cute, and I think I might need to do some research for a camel coat! Katie, yup same here...Usually by February I'm desperate...giggle!